If you think of India and imagine vibrant colours, traditional clothing, throngs of people and fervent prayer—Varanasi is for you. Rich in history and mythology, it is believed that Lord Shiva and his wife, Goddess Parvati, stood here at the beginning of time. There is also mention of the city in some of the age-old Vedic scriptures and the Mahabharata, one of the two major Sanskrit epics of ancient India. Much of this love for Varanasi is because of its position, perched on the banks of the Ganges. The river is central to the city and the name “Varanasi” is derived from the names of two Ganga tributaries – the Varuna and the Assi. 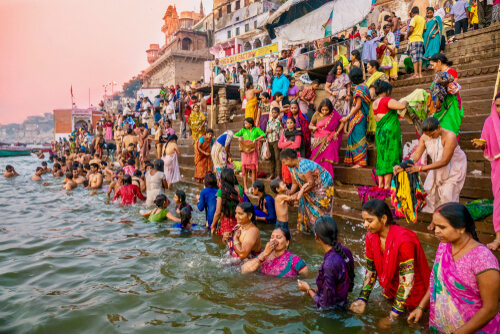 Hindus consider the Ganges so sacred that a dip in its waters has the power to rid you of past sins. Your only deterrent from this path to salvation is that the waters are devastatingly polluted. But there are other ways to explore the sacred river. A great way to get a sense of the area is by taking a boat ride, preferably at dawn. At this time, the weather is just right and while there are people around (it’s India, there are always people around) it is still early enough to avoid unbearable crowds. As you ride along, you will get a glimpse of the old architecture and temples (there are over 200 of them) kissed by the rays of the rising sun. Sailing by, you’ll pass pundits who have come to enjoy an early morning dip, devotees who’ve come to bathe, private rituals and last rites —all performed on the ghats or steps that lead down to the river. While there are close to 100 ghats that travel across 7km of Varanasi, only a handful hold significance and can be used for rituals. The evening aarti, a Hindu worship, is a surreal, not-to-be-missed experience. People from all over the city gather around the Dasaswamedh Ghat. The ceremony is performed at sunset and lasts for about 45 minutes. Religious songs, chants and the clanging of bells fill the air as a row of pundits conduct the main aarti with fire lit lanterns offered to the Gods. The end of the ritual sees the release of small diya (clay lamps) onto the water for a sparkly culmination of the ceremony. The effect is heavenly. 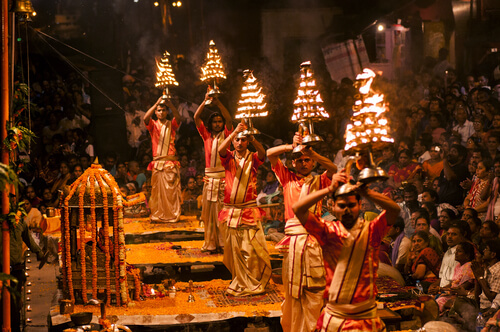 While you may not leave Varanasi with a newfound faith, it is certainly a cultural eye-opener. Amongst the chaos, crowds and high decibel levels, you can’t help but marvel at the devout followers. And maybe through it all, you will have a private moment of divinity. Either way, the oldest and most spiritual city in India should be ticked off your bucket list.